Taking the star photos is the hardest part of making a star trail. Stacking them together is not much more complicated than the process for making a panorama in an application such as Windows Live Photo Gallery. You'll need a specialized star-trail stacking program; I recommend two, both of which are easy to use and free. Achim Schaller's Startrails is a good choice because it can not only stack your photos but also make an animation of the stars rotating in the sky. StarStax is a similar program, but it lacks the animation option. Star-trail photography and animation become easier with Achim Schaller's Startrains. 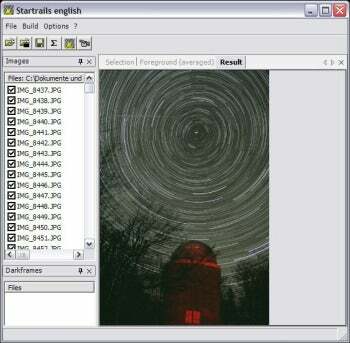 To use Startrails, for example, simply download the program and copy the folder to a location on your PC (the program requires no other installation). Run Startrails by double-clicking the icon in the program folder. Select File > Open, and choose all of the photos from your star shoot. Then, click Build > Startrails. A few minutes later (it might take a while on a slower PC, or if you have hundreds of photos), you'll end up with a completed photo that you can save to your PC. Note: This software is donationware. It's free to use, but the developer accepts and encourages donations toward further development. For more information on how to make star trail images, see "Create Beautiful Star-Trail Photos With Almost Any Camera."